Pesticides have the potential to harm people (especially children), domestic animals, wildlife and the environment. If pesticides are improperly disposed of or improperly stored, humans or animals can be poisoned through the skin or inhalation. Improper storage of chemicals can also lead to chemical explosions, fires, and spills that can cause harm to well water, ground water and the ecosystem. When pesticides are stored properly, not only is the harm to human health and the environment decreased substantially, but properly stored pesticides can extend shelf life of the chemicals as well as avoiding costly fines. Proper labeling on your pesticide storage is very important to manage your pesticides accordingly. Check labels on your pesticide containers frequently. This will allow you to keep up-to-date with your expiration dates and when you should use your pesticide storage buildings. If a label is torn or becomes hard to read, contact the manufacturer or distributor for a new label. This guide presents a summary of responsibilities under the North Carolina pesticide storage rules. A proper leak-proof pesticide storage facility that is fully compliant must be implemented. 5. Use classification – Either restricted use or general. Keep your pesticide storage away from direct sunlight, or heat. If pesticides are heated they may be vulnerable to combustion and/or can be flammable. 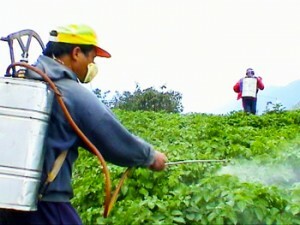 Do not store pesticides in a valley where run-off can penetrate your pesticide storage facility. Store all pesticides in a secure & locked container where they cannot be accessible to unauthorized persons when unattended. Keep your pesticides in a dry storage area. The person responsible for each pesticide storage facility must be in charge of keeping that pesticide storage facility completely maintained and compliant. Pesticides must not be stored within 200 feet of the property line of any schools, hospitals, nursing homes, or any other institutions. Any person who is operating a pesticide storage facility must manage and update a current inventory list of the names of the pesticides that are being stored.